THE National Football Museum in Manchester has launched a National Football Shirt Amnesty to help charity Street Child World Cup make a difference to the lives of street children. The museum is asking householders across Britain to dig into their wardrobes to find their old, unloved football shirts. Those old, worn out, ill-fitting strips can help bring new joy to homeless children across the world. They have pledged to collect any football shirts handed in or sent to the museum, on behalf of Street Child World Cup, who will share the shirts across 19 countries with a network of outstanding grassroots projects, which use football to help transform the lives of children living and working on the streets. Street Child World Cup, is an international movement for street children to receive the protection and opportunities that all children deserve, through football, art and an international conference for street children. 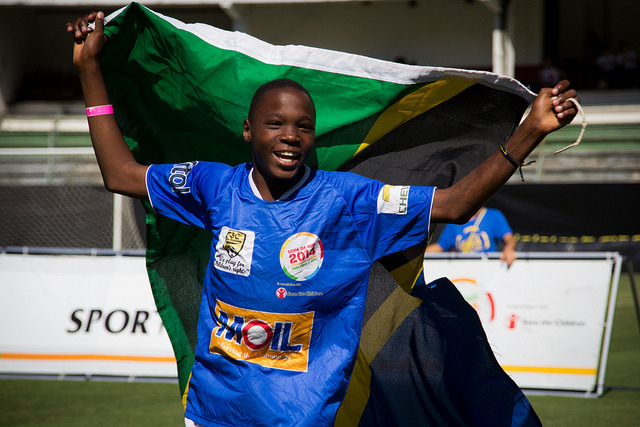 Ahead of each FIFA World Cup, Street Child World Cup unites street children from across the world to play in a unique football tournament challenging the negative perceptions and treatment of street children. The team at the acclaimed National Football Museum aims to collect as many old football shirts as possible to help the charity. Museum director Kevin Moore said: “We believe there’s barely a home in the UK that doesn’t contain a football shirt. We know that many of these shirts lay neglected in the bottom of wardrobes and cupboards. “These shirts can help bring much needed support for charities like Street Child World Cup – and our aim is to collect as many shirts as we can to do just that. “If you have an old, unwanted football shirt – maybe it doesn’t fit any longer or isn’t worn because it’s a few seasons out of date – then get them to us, either by post or by dropping them off at the museum in person, and we’ll make sure they help improve the lives of some of the world’s least fortunate children. Museum partners Campo Retro are even offering an extra incentive to anyone who donates a shirt: £5 off any new football shirt ordered through their website. John Wroe, CEO, Street Child World Cup said: “Every football shirt you donate represents a dream and we believe in the dreams of street children to leave the streets behind. Our projects use football to engage the most hard to reach young people and educate them with life skills so they never return to the streets. The children learn valuable lessons like team work and discipline but above all else, football is an opportunity for them to have fun and dream which every child has a right to do." The National Football Shirt Amnesty runs from 15th August – 26th September this year.